We demand a lot from our kitchen countertops; expecting them to be both a beautiful feature in our homes and a functional surface to aid our cooking. To meet these needs, many people set their hearts on a natural stone counter. Stone offers an unparalleled natural aesthetic, and lends a timeless style that will make you want to keep it in your kitchen for years. 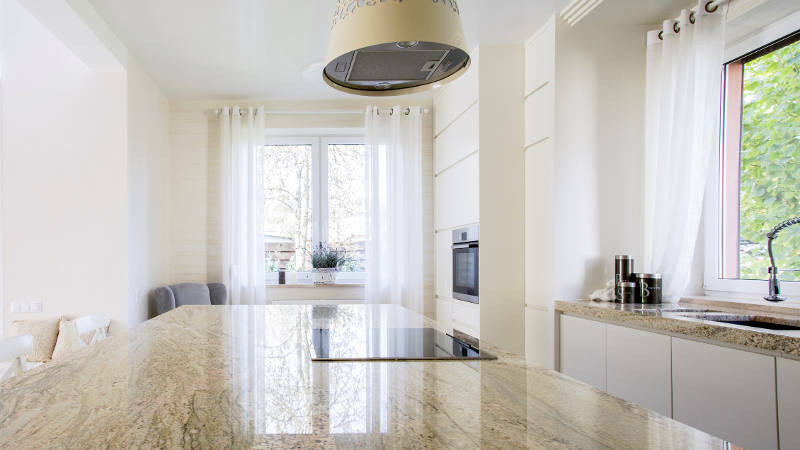 However, before you decide on a particular material, there are a few key factors to discuss with your kitchen designer, in order to find the most suitable stone for your dream worktop. The first is the most obvious; what are your kitchen style aspirations? The lustre and character of stone fits perfectly in a traditional masterpiece, but there are also options for creating a chic, contemporary haven. Heavily patterned stone can create a lot of visual noise, so before choosing your counter decide whether you intend to use one type across the whole kitchen, or if you can mix and match complementary materials. This can have a major impact on another key consideration: your budget. It can be tempting to splash out on a stunning marble worktop, but there may be a more affordable option that creates an equally beautiful effect. It’s important to think carefully about the landscape of your surfaces – are you planning a kitchen island, or breakfast bar? If so, how will these stand out from or blend into the rest of your counters? Keep the bigger picture in mind, and make sure that the stone you choose will match your other details, like backsplashes and cabinet designs. At Chandler Stoneworks, we want to help make your decision simple, so here’s a brief summary of our most popular materials, and how they might work for you. The epitome of traditional elegance, marble lends a timeless sophistication to any kitchen. Its distinctive appearance is synonymous with luxury, and the perpetual coolness of the stone makes it the perfect choice for avid bakers. The main drawback of marble is its vulnerability to stains, so if you are set on marble counters, consider combining them with a complementary material in different areas of your kitchen. Note that the marble is available in four categories, based on its hardness. Grade A contains fewer flaws and veins; Grade D is more decorative with considerable colour and pattern variation. Granite comes in a range of brilliant colours, from mottled creams to dramatic reds. Its natural variation means that every single counter is stunning and unique. 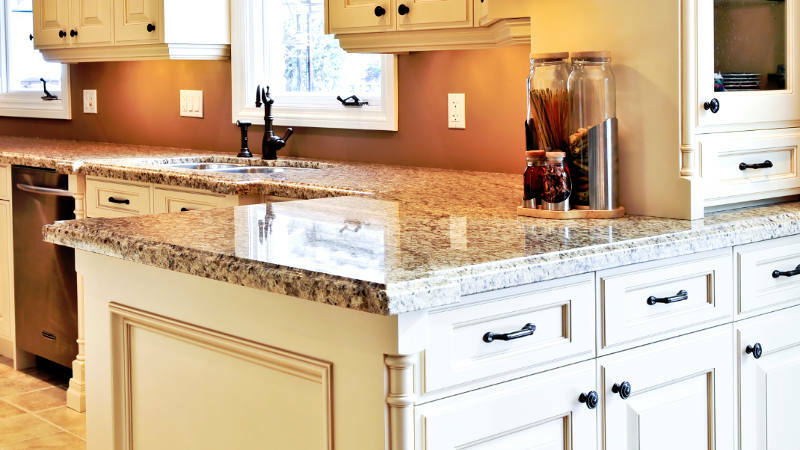 Granite is also incredibly durable and, once sealed, it will resist heat, scratches and stains. Perfect for making a statement in a busy kitchen, the only limitation is the sturdy cabinets you will need to support its weight. Slate countertops have been growing in popularity, due to both their exceptional durability, and striking, sultry colours. The material is natural non-porous, making it resistant to stains, and is impervious to heat – so you can set hot pans down without worrying. Formed all over the world, slate colours vary according to the minerals contained inside them, although matt shades of grey, black, green and purple are finding their way into modern homes. Quartz surfacing is created using a combination of resin and coloured quartz chips, making it a highly desirable balance between beautiful natural stone and functional solid surfacing. 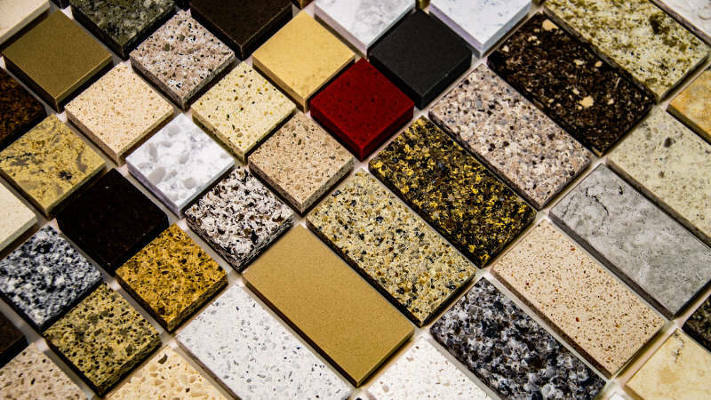 Worktops from composite quartz benefit from being easy to maintain, and are available in a wider range of colours than natural stone. You won’t get the unique pattern variation as found with marble or granite, but if you prefer a minimalist or contemporary look, this might be perfect for your kitchen. With modern designs favouring seamless counters in neutral shades, choosing a tiled countertop in natural stone or quartz can help make your kitchen feel truly unique. Tiles offer a huge variety of colour, size and texture options, allowing you to create a uniform pattern or mix and match as you like. Tiles are generally resistant to stains, heat and scratching – although should the worst happen you can replace chipped or cracked tiles far more easily than a solid counter. Hopefully this will help you make a confident decision when choosing your new kitchen worktop. If you have any questions, don’t hesitate to contact our friendly team to see how we can assist you.